You might think a science fiction special effects extravaganza would be the best representation for the definition of a Blu-ray Disc. Yet the 70th anniversary edition of Casablanca that I received complementary from Warner Bros. Entertainment is a stunning example of the quality of the medium. The picture has been painstakingly remastered one frame at a time. Matinee icons Humphrey Bogart and Ingrid Bergman have a clarity as if the movie had just been released. Who knew that glorious black and white could be more vivid than a color movie? It doesn’t hurt that the story is considered by many to be the greatest ever filmed. THE classic romantic drama set in early December 1941 during World War II . Our story concerns “Rick’s Café Américain”, an upscale nightclub and casino. The hangout is the setting for the wheeling and dealing of various public officials and refugees desperately trying to get out of Northern Africa to the more friendly atmosphere of America. The establishment is run by Rick Blaine. Humphrey Bogart is a jaded American expatriate who is beholden to nothing and no one. That all changes when into his joint walks Ilsa Lund and her husband Victor Laszlo, a renowned Resistance leader and idealist. A fugitive who has escaped a Nazi concentration camp, he is seeking “letters of transit” which would allow he and his wife to leave for America where they can continue his patriotic work. The characters elevate Casablanca to the very epitome of supreme sentiment. Humphrey Bogart, Ingrid Bergman and Paul Henreid form a love triangle that consistently engages the emotions from beginning to end. One can almost see themselves in the narrative structure. It’s a film about falling in love, making difficult choices, and doing what’s right. Despite Bogart’s stated indifference, his actions betray some profound feelings. Ingrid Bergman is the woman torn between two lovers, but with a detached personality that’s a bit challenging to read at times. Claude Rains as Captain Louis Renault is a rather self serving fellow. 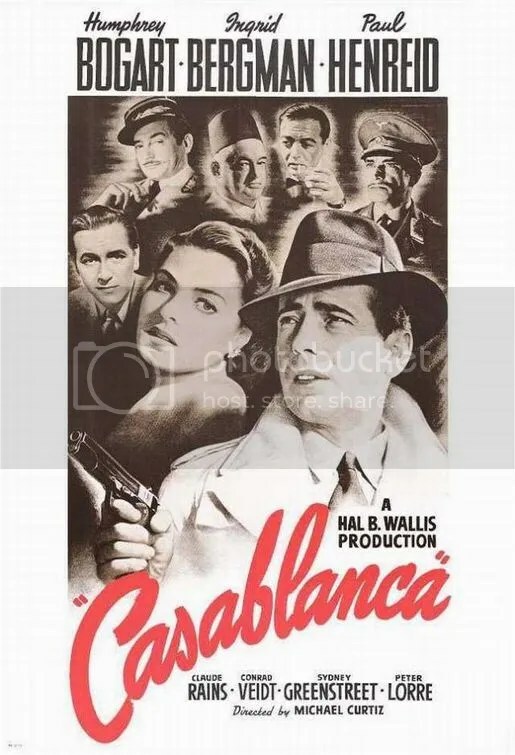 As Vichy France’s prefect of police in Casablanca, he’s unscrupulous and corrupt, cooperating with the Germans who happen to be in charge. “I blow with the wind, and the prevailing wind happens to be from Vichy.” Yet his friendship with Rick appears sincere. Renault shows signs of being a decent man at heart. Conrad Veidt portrays Major Heinrich Strasser with distinctive restraint as the chief Nazi villain and Victor Lazlo’s foil. It’s clear why this has become the standard by which all romances are judged. Casablanca is a script of Swiss watch precision. It breezes by in a brief 102 minutes. Not a single moment is wasted, not a solitary misplaced word. It’s surprising that this drama set during World War II contains no battles, no extended fist fights, and no reliance on any physical action whatsoever. The one altercation that erupts in the bar is quickly ended by Rick. What we do have is one famous scene after another. Just try and not feel a tinge of French patriotism when the cafe patrons sing La Marseillaise drowning out the Nazi’s rendition of Die Wacht am Rhein. What still fascinates is the depth of emotion that emanates merely from the written word. The script, which won the Academy Award, is amongst the greatest of all time. The writing is a treasure trove of classic lines that are some the most recognizable ever written. That climax at the airport is the perfect culmination of any plot ever committed to celluloid. It feels so right. Perhaps the freshness of the scene is somewhat lessened by the familiarity of the dialogue. But that’s merely a tribute to how enduring those phrases remain. Casablanca is an original that single handedly justifies the importance of the film medium. 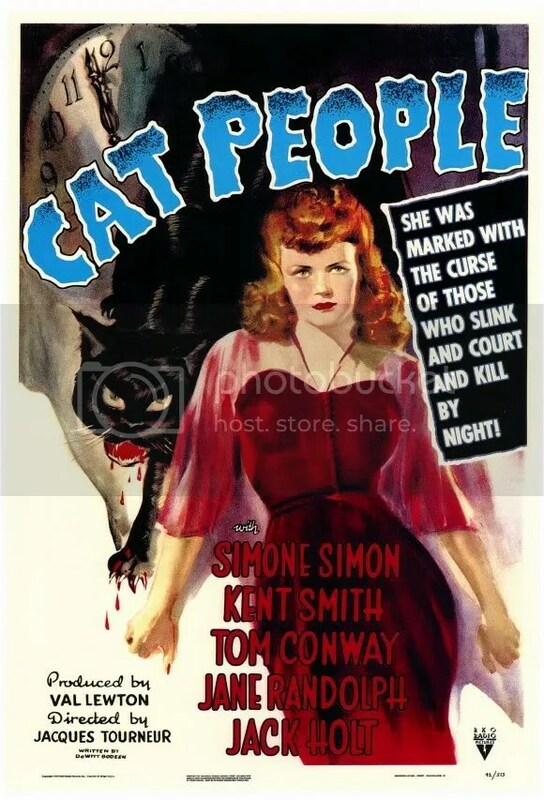 Brooding film noir from producer Val Lewton is a triumph of imagination over budget in this haunting horror film. Relies not on overt shocks, but on a moody sense of dread. The whole cast is brilliant but Simone Simon as Irena is especially effective, suggesting subtle catlike behavior in just her movements. Remade less successfully in 1982.